On the day dedicated to the memory of the Blessed Virgin Mary, Mother of the Church, Francis says that "the Church is feminine, because she is 'church', 'bride': she is feminine. And she is a mother, she gives birth. Bride and mother ". 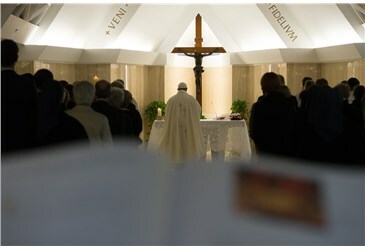 Vatican City (AsiaNews) - "The Church is a woman" and if she lacks this identity she becomes "a charity association or a football team"; when "it is a male Church", it becomes "a Church of old bachelors", "incapable of love, incapable of fecundity", said Pope Francis at Mass this morning at Casa Santa Marta, on the day dedicated to the memory of the Blessed Virgin Mary, Mother of the Church. 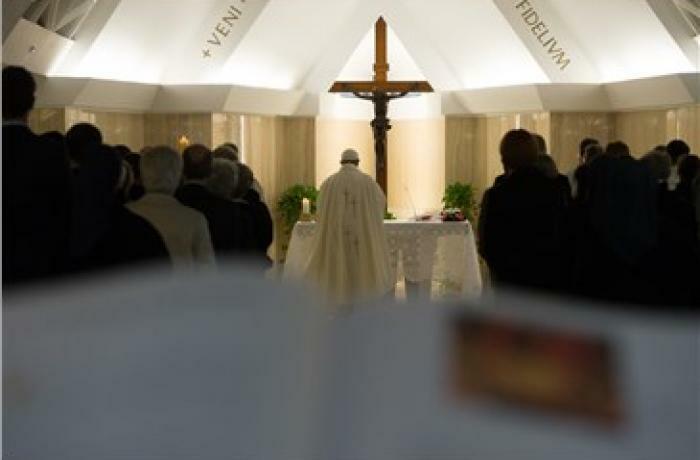 In his homily, Pope Francis said that in the Gospel, Mary is always described as “the Mother of Jesus,” instead of “the Lady” or “the widow of Joseph”: her motherliness is emphasized throughout the Gospels, beginning with the Annunciation. This is a quality that was noted immediately by the Fathers of the Church, a quality that applies also to the Church. The Church is feminine, because it is “church” and “bride” [both grammatically feminine]: it is feminine. And she is mother; she gives life. Bride and Mother. And the Fathers go further and say that even your soul is the bride of Christ and mother.” And it is with this attitude that comes from Mary, who is Mother of the Church, with this attitude we can understand this feminine dimension of the Church, which, when it is not there, the Church loses its identity and becomes a charitable organization or a football team, or whatever, but not the Church. The important thing is that the Church be a woman, that has this attitude of a bride and of a mother. When we forget this, it is a masculine Church. Without this dimension, it sadly becomes a church of old bachelors, who live in this isolation, incapable of love, incapable of fecundity. Without the woman, the Church does not advance—because she is a woman. And this attitude of woman comes from Mary, because Jesus willed it so. The virtue that primarily distinguishes a woman, Pope Francis said, is tenderness, like the tenderness of Mary, when she “gave birth to her first-born son and wrapped Him in swaddling clothes, and laid Him in a manger.” She cared for Him, with meekness and humility, which are the great virtues of mothers. A Church that is a mother goes along the path of tenderness. It knows the language of such wisdom of caresses, of silence, of the gaze that knows compassion, that knows silent. It is, too, a soul, a person who lives out this way of being a member of the Church, knowing that he or she is [like] a mother [and] must go along the same path: a person [who is] gentle, tender, smiling, full of love.